I haven received lots of request for a TH6 War base layout since couples of months ago, especially after the new update with 2 Air Defense at Town hall 6. The base I am going to give you today, which was designed by Sardseng – The Pendulum, is one of the best I have seen for months. Hopefully you will like it! Note: Don’t care about my Town Hall and building levels. I don’t have a TH6 base at the moment so I just used my TH7 account xD. That’s great If someone can help me with improve this post with a TH6 screenshot! Spring Traps arr placed in funnels. Giants, the most used troops in Wars at TH6, will always pass through them and get blown away. Centralized Clan Castle. I recommend donating 1 maxed Dragon in Clan War to the Clan Castle. Air Defenses can protect nearly the whole base. The Air Sweeper can cover both of ADs. High HP Storages protect key defenses. Barbarians and Archers will be locked on those Storages while getting hit by Mortars and Wizard Towers nearby. 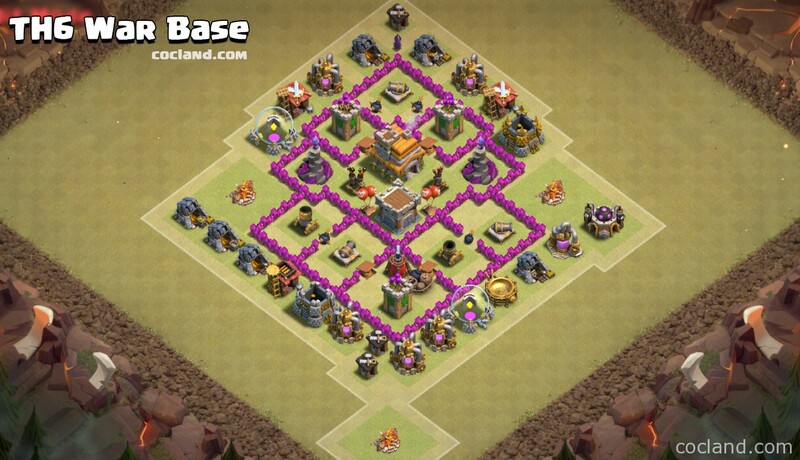 This TH6 War base is a mini version of the Southern Teaser base. 1 Armp Camp at the bottom is always a sweet place for the attackers to lure out Clan troops. Thus, they usually attack from the South instead of other sides. Attackers can snipe 1 Air Defense inside with Hogs since this base is long and thin. I haven’t had any decent defense log of this layout yet since I don’t have any TH6 account. That’s why I really need help from you! Don’t hesitate to comment If you need any help or have any suggestion! Also, don’t forget to post the defense logs here. That will help us improve this page as well as the base above a lot! Thank you very much and good luck with your next Clan War!